Yesterday, my cousin and I were watching a bit of early silent films on TV, and I mentioned something about it being a very different form of film than modern. David went on to highlight the use of a single camera, not moving. He then mentioned that when he was working on his PhD in Education (1970 from Arizona State University, and yes, he remains a die hard Sun Devils fan) — that he did some work in educational technology, I think he even said he worked on a “minor”. That made me curious about what was “cutting edge” back then. He talked about video, and how he did some early stop motion video with humongous cameras. David also described things people were doing with printed text in making texts or activities that had a non-linear design (if you answer this, go to page X). Yeah, print. And this was the time when the cutting edge of technology, right out of the bowling alley, came on the scene– overhead projectors! A reply came in from Kim, citing that 16mm projectors were scary! And I had a brain synapse spark or something, because I had the memory surge from back in fifth grade- when the scrawny kid version of Alan did exactly that, operated the 16mm projector. My school did something now that I never would have cited then as being innovative, but thinking about it, the folks at Bedford Elementary were just that. This is maybe 1973, and a few kids, including me, got to me on “A/V” crew. There was a small closet with carts that held things like opaque projectors, film strips, super 8 loops, and the two big guns, 16mm projectors. The A/V crew were charged with knowing how to use the equipment, and bringing it to teachers who requested use of them, as well as operating them for teachers. The task was threading the film from the front reel through the machine, and onto the take up reel in back, and the key was making sure you got the right sized “loop” right above where it went down in front of the lamp. Doing this for a class was pressure enough, but getting ti right for an assembly when everyone was watching? Well you did not want to screw up. There was time when that know it all math teacher, Mr Fike, tried to adjust something in the middle of a showing, and kept screwing up… he finally let me step in and fix it. When I think about it, maybe it was not huge, but my school, teachers, principals, gave an appropriate amount of responsibility to us kids. When we went into the classroom with a machine, the teachers were looking to us to be the ones who knew what to do with them. This was some profound start on my tech career, and I had completely forgotten about it until now. Also forgotten was in middle school, where I joined Stage Crew, and became the kid who operated the lights for the plays we did, yanking down those big switches, and throwing the spots on. Again, giving kids responsibility is a huge learning boost as well as confidence. I wish I could thank my elementary school! Go Bedford Bees! 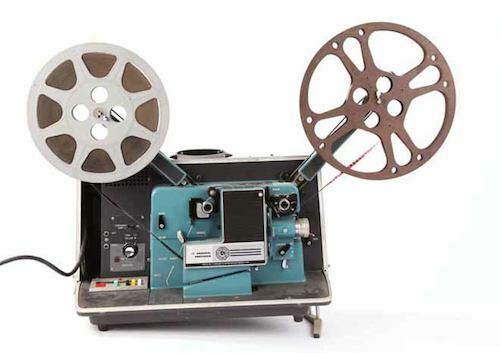 If you can remember, one step lower-tech than the movie projector was the film-strip projector – single images stacked on film and winded manually to pause on each image. As an early example of student-generated content, my teacher (in about grade 3 or 4) gave use blank strips and felt pens to draw our own sequence of images to show the class. Pick me, pick me! I have a masters degree in ed. media where we learned how to operate all that equipment, make bulletin boards (!?! ), do rubbed letters onto transparency film, all sorts of neat handicrafts. No computers, folks. They were several years away yet. Our video introduction was reel tape, but 3/4 inch cartridges were just coming out. Life was very much analog back then in 1975. Things sure have changed in 36 years.